After my Grandma Irene passed away, my Mom wanted to know if there was anything special I wanted to remember her by. I asked for her recipe box and it is really one of my treasured possessions. And who would have thought decades later, I’d be sharing Grandma’s recipes on the internet. Wow! One of the recipes from Grandma’s recipe box that brought back so many memories is My Grandma’s Apple Cake with Caramel Rum Sauce. Grandma’s Apple Cake with Caramel Rum Sauce isn’t a silly, light cake. Nope. This is a moist, dense cake full of apples and has a cinnamon nutmeg-gy flavor. The top is a little browned and the edges get a little crunchy. It’s cake-like and kind of a little chewy, and caramelly all on its own (even before the sauce) with all the apples and sugar that get all caramelized in the baking process. When stored, though, the moisture gets pulled throughout the cake and the crunchiness is lost, but it’s good either way, fresh from the oven and still moist even days later. I love that this cake can be made and served warm, fresh from the oven or saved and served later. Instant gratification and no need to wait for the cake to cool! It’s also pretty sturdy, so it can be served just out of the pan at an event, grab and go. But my Grandma’s Apple Cake with Caramel Rum Sauce isn’t meant to be served on its own, though. Oh, no. You need that sauce – and I know you want it! But what really takes this cake totally over the top is the bit of rum in that easy luscious caramel sauce. Oh my gosh, that sauce is just insane. You’re gonna wish you swim in a big, huge vat of this stuff. And that sauce, poured over this cake just envelopes it and drips down the sides. It’s a thing of perfection! And if Rum isn’t your thing, add whatever you’d like, vanilla or another alcohol. Maybe brandy? or nothing at all. It’s all good! If you want to be just a bit more cray-cray, add a touch of brandy and pinch or two of Apple Pie Spice to your whipped cream. Brandy spice whipping cream? Yes, please. Or maybe you’d like to sprinkle this with sea salt and serve with vanilla ice-cream, instead. The funny thing about Grandma’s Apple Cake with Caramel Rum Sauce is that I don’t remember my Grandma or my Mom making this particular recipe. But what I do remember is having this very same cake at Church functions, Funerals, and School Lunch. I also don’t know of anyone that didn’t grow up in my part of Northwest Iowa that’s ever made or even heard of this particular recipe, although it was obvs passed around in the area I grew up in. With the miracle of the Internet, I’m sure I’ll hear from more people or find others making this same recipe but in the meantime, Grandma Irene, thank you and I love it! And I miss you, still! By the way, the cake is served on my Great Grandmother, Phillipina’s plates! This cake and sauce are both super easy to make. I adapted from shortening to the right amount of butter because almost all of Grandma’s old recipes called for shortening. The only bummer about apple cake? The apples need to be peeled and chopped and there’s no doubt that’s a chore! Before I got my apple peeler, corer thingy, I used to peel by hand and then use one of those round apple slicers that you put on top of the apple and press down. Those are cheap gave me a head start and made chopping easier. Now I use my Apple Peeler/Corer and so love that thing! I love it even more after I figured to clamp it over a paper bag. That bag catches all the peelings and the juices and clean up is a breeze. Toss the whole works or put the peelings out for your woodland friends, well away from your house or your neighbors! If you don’t have paper bags, use parchment or one of those thin, flexible cutting boards. Once the apples are peeled and chopped, I just slice through them vertically and lay down those slices and run my knife through them. It’s like a 10-minute process and I have all my small apple bits. The Caramel Rum Sauce is super easy to make and can be made ahead. It’s going to be very liquidy in the hot pan but thickens as it cools, so set it aside for a few minutes so it thickens up a bit before you pour it over your cake. Reheat it gently in the microwave to get the right consistency if it’s been refrigerated or gotten too thick. It takes seconds, like 20 or 30 seconds. If you get it too hot and it’s too runny again, stick it in the fridge for a few minutes. Grandma’s Apple Cake with Caramel Rum Sauce – if you put whipped cream on first it won’t slide off when the caramel is added. I know I’ve talked a lot about saving money on baking items, on my site here, so I’ll just mention, if you don’t have an Aldi, where the regular old prices are about the same as my grocery store prices, or don’t have a Costco (again, great prices) really shop all the sales around holidays, especially holidays that are known for baking: Thanksgiving, Christmas, Easter and sometimes Valentine’s day. Apples can be downright cheap or rather pricey depending on where you live. Yeah, I was shocked to see how cheap lemons were in Georgia and how expensive those apples were! Just the opposite of what I’m used to up here in Minnesota. Again, check Aldi, or watch the sales at the grocery store. You want a good, hard tart apple for baking recipes, and the plain old Granny Smith is one of the best baking apples there is. And Granny Smiths are usually sold in bags and bonus! They’re cheap. You don’t need a super premium large sized apple for this recipe. A medium sized apple will give you about a cup of apple in a small dice. If you are using larger apples, you’ll probably need four rather than the five the recipe calls for. And another bonus, the smaller apples are generally less expensive than the larger ones, too. Cream sugar and either shortening or butter, add eggs one at a time. Mix dry ingredients and whisk together; add to sugar mixture and mix. Mix in apples by hand. This will look thick and strange – it’s ok, just forge ahead. You’ll think I forgot the liquid in this recipe, but as the apples are mixed in, the juices moisten the cake. Spread in a 9 x 13 pan, bake at 350 degrees for about one hour. The top should look dried and a little darkened in places. Test by pressing lightly on the top of the cake; when the indentation comes back up, the cake is done. Notes: This batter is really thick and you will have to spread it into the pan – you haven’t made a mistake! This is the perfect recipe to use an apple/corer/slicer. Mix ingredients in a saucepan and bring to a simmer. Simmer 2 – 3 minutes until slightly thickened. It will thicken more as it cools, and it should be loose. If it is cooked too long and thickened more than it should be, you’ll likely find it cloying. It can be flavored with other flavors instead of rum. 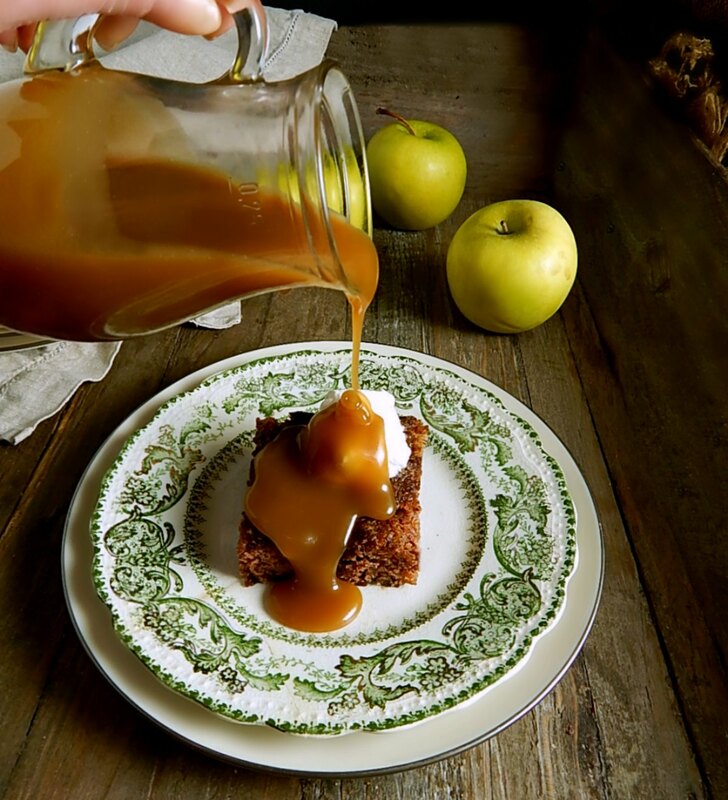 Grandma’s Apple Cake with Caramel Rum Sauce – apple corer/slicer makes short work of things! Rinse it as soon as you are finished. I’ll be sharing Grandma’s Apple Cake with Caramel Rum Sauce at Fiesta Friday #247, hosted this week by Antonia @ Zoale.com and Laurena @ Life Diet Health. There’s lots of fun fall dishes & Halloween Party food already linked up there! Stop by and check it out. I originally posted Grandma’s Apple Cake with Caramel Rum Sauce in 2011, and it ran $3.59 to make. It’s still under $5.00 if you shop carefully for your butter & cream! I reworked the post and added new photos October 2018. Here’s my original pic – so sad!! This entry was posted in Click here for Fabulous Food Posts and tagged Alcohol, Apple, Cake, caramel sauce, Cream, Dessert Sauces, Desserts, Family Recipe, Grandma's Recipe, Rum. Bookmark the permalink. Your picture with the caramel dripping down the glass dispenser is just perfect. I love warmed cakes and this sounds off the charts delicious! Thank you for bringing your Grandma’s scrumptious cake to Fiesta Friday! My Mom used to make this as well, I have. It is one of the best desserts! Hi Mary Ann! Sorry to reply a couple days later, but it IS so incredible, isn’t it!! Was your Mom and family from Iowa by any chance? It seems so many of my friends outside of Northwest Iowa have never heard or tasted it – but they all love it!! No, she was from mid north Ontario, Canada. I think her recipe came from a church group in Toronto. Oh.My.Goodness! I have recently discovered the beauty of dark rum & I love baking with it [made rum & vanilla cupcakes yesterday!]. I am soooo Pinning this – will make next time apples are really cheap. This is really an old-fashioned family favorite! I actually have apples on the table to make again – and I think I’ll try to take a better picture…I hope you’ll make it and let me know what you think! The rum in the sauce is amazing, especially since it’s combined with caramel. It’s not overwhelming at all, just a hint that leaves a subtle flavor. Will I sound strange if I say it’s “satisfying” or “warm?” It’s like coming home on a dark, drizzly evening and seeing the lights in the window and knowing everything inside is warm and cozy. I hope you’ll post your cupcakes – they sound very interesting and I bet the rum makes plain old vanilla just sing.